It’s hard not to root for MV Augusta. The Italian brand has a storied racing history, and post-HD ownership embarked on product blitz to try and fix public perceptions. They’re flawed, exotic, beautiful machines, and very Jalop. Sean says the Brutale 800 RR is still the best sport naked he’s ridden to date, and their latest efforts since Mercedes-AMG purchased a 25% stake in the brand have made a huge dent in both the bikes’ quality and their parts supply issues. For 2016, they have some minor changes across their three cylinder family, and a new motor, but surprisingly for an Italian, it’s pretty quiet this year. The biggest change is in the heart of the Brutale 800. Its new Euro 4 compliant triple cylinder engine is down in power and slightly up in torque:.The new Euro4 compliant engine makes 61 foot-pounds at 7,600rpm, up from 59, and horsepower drops from 125 to 116hp at 11,500rpm. Weight also grows 17 pounds to a claimed dry weight of 385.8 pounds. In a show filled with only more power, this is a surprise. It is also unclear if this new motor is being expanded into the rest of the line, or just the Brutale 800 for now. Graphics, anodized red pieces, carbon fiber with a fancy 3K opaque finish, and over 50 more changes. That’s what changes a regular MV Agusta Dragster RR must undergo to be fit for a prince such as Lewis Hamilton. 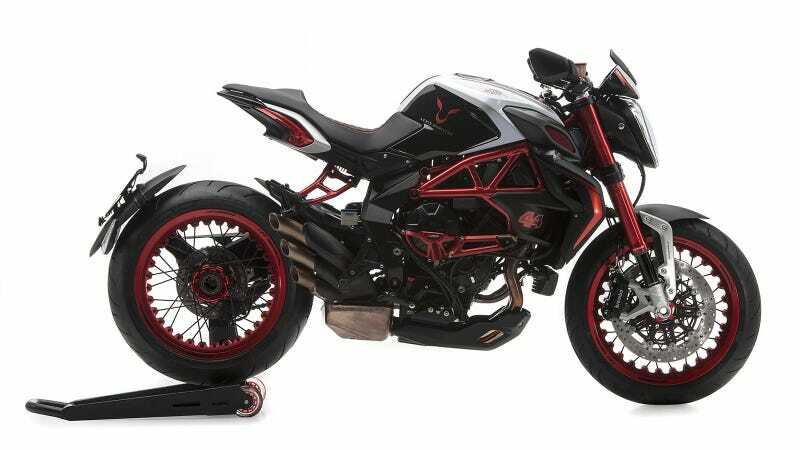 The Dragster RR is in itself a factory custom version of the Brutale 800, featuring the same triple cylinder engine, but with a wider rear tire and a truncated subframe. There will be 244 made, with no price yet announced. Yay for marketing synergies. The final changes that expand across all of the three cylinder MV’s (Dragster, F3, Rivale, Stradale, and Turismo Veloce) are black engine finish instead of silver. Oh, and the Rivale also gets a slighty bigger tank at 4.2 gallons instead of 3.4. Joseph Gustafson is Lanesplitter’s most loudmouthed contributor. Follow him onInstagram and Twitter.